Well, it’s been a very busy few days around here and blogging got put on the back burner (although I’ve really, really missed it)! 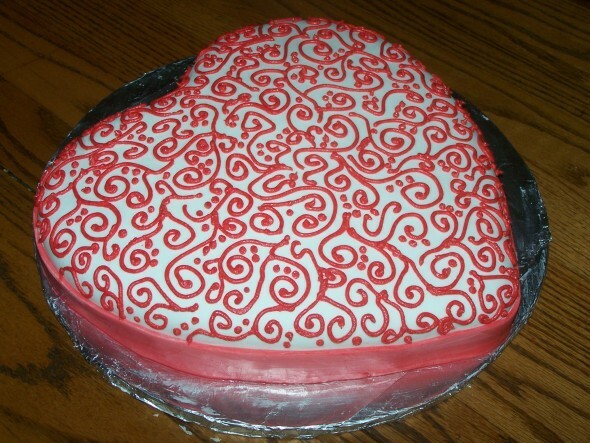 So, you all know I love to decorate cakes and I got to spend most of Friday making a cake for the Valentines party at our church Saturday night! I told you before that I’m doing my brother’s wedding cake in May and I wanted to practice scroll-work (never done it before) and try a new recipe…marshmallow fondant – so I gave it a try on this cake! They were almost as popular as the cake at the party..and I was thrilled to not be throwing the cake away! But, the second time was a success and I was really happy with the way it turned out. But, my cake making wasn’t done for the weekend! I had planned to make Oreo Balls for our Super Bowl Party, but the Oreos that I purchased (with little footballs on them) ended up being Double-Stuffed (doesn’t say that on the package) and I wasn’t sure they’d work out great for the Oreo Balls, so I decided at the last minute to make cupcakes instead. And because I love, love, love to decorate…I had to make them cutesy and themed for the party! Since they really were last minute (I was still working on them when my family started to arrive), I didn’t get too complicated. 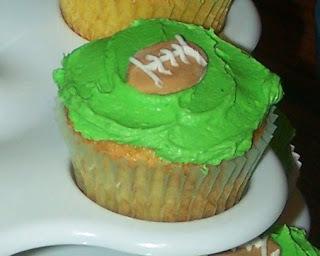 I just smeared on some green buttercream and with my hubby’s help, we made some tiny fondant footballs. Pretty cute, huh? All that mattered (to the kids) in the end, was that they got to eat them! 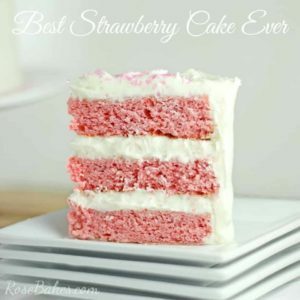 So…there was tons more food involved for our Super Bowl Party, and I’ll put up some of those recipes throughout this week, but for now..I just wanted to share the cakes! Happy Monday! Thanks Deb! The Cake Balls really were super popular and pretty easy to make with a pile of crumbled cake!